Flame's arrival at the sanctuary was due to the efforts of a concerned citizen who had grown tired of watching the poor horse starving. Flame's owner had had him for 2-1/2 years and had never even bothered to name him. He arrived at his owner's place as a fat, healthy young horse, but the photo to the left shows the horrible condition he was allowed to fall into. 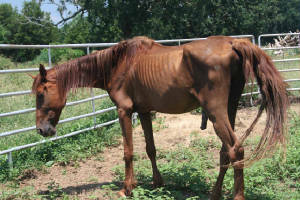 We are sad to say that 2 horses in poor condition still remained with the abusive owner at the time of Flame's rescue. Flame came from Cabarrus County. Our farrier/trainer recognized Flame when she met him at the sanctuary, although he had gone by a different name previously, and believes him to be an American Saddlebred. Flame is in excellent health and is now available for placement. Thus far, Flame has shown a desire to friendly, curious nature and desire to please his person and we have great hopes for him! We have been riding him in our training program and he is proving to be a wonderfully responsive horse. He has good focus in the arena. 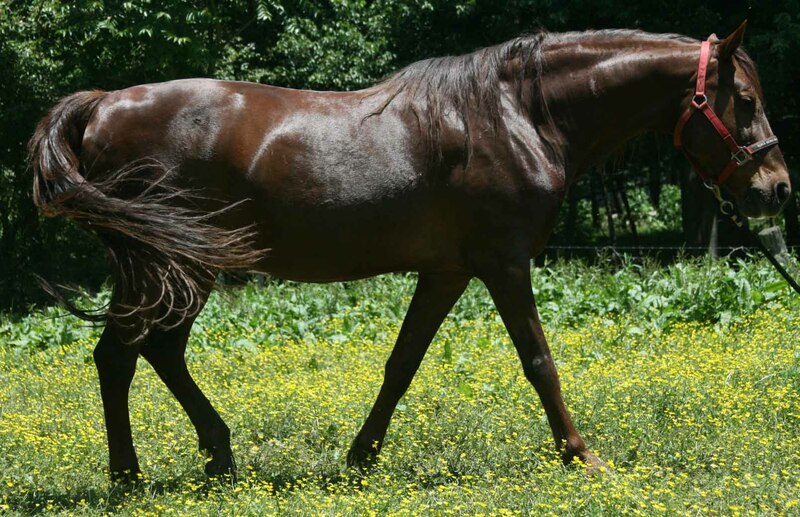 He is wonderfully supple and responsive with smooth gaits. With off property riding Flame does not want to walk. His former rider never required this of him so we are teaching him to relax and to walk going out and returning home. Flame needs an experienced rider that will continue to work with him on learning to do this.